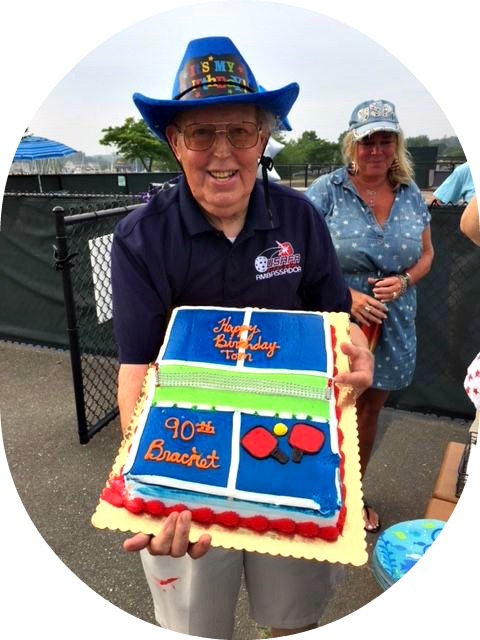 A tireless promoter of the game — and the driving force behind the Compo Beach courts — the longtime Westporter turned 90 years old on Tuesday. Naturally, he celebrated it with pickles — er, pickleball. About 30 picklers showed up to honor Tom. And they gave the new nonagenarian a great gift: a pickleball bench in memory of his wife Jean, who died just a few months ago. A pickleball cake for Tom Lowrie. Tom had a great time, with his many pickleball friends. Then he went right back to work, pushing for more courts, clinics and programs for Westport picklers of all ages. This entry was posted in Beach, People, Sports and tagged Compo Beach, pickleball, Tom Lowrie. Bookmark the permalink. Happy Birthday Tom! You are an inspiring young man! He really is Mr. Pickleball. I knew who you were talking about without reading the article. Kudos to Tom for his dedication and commitment. He is a ture ambassador for the game. Happy Birthday Tom you are a true gentleman. And Dan didn’t mention your golf prowess! Tom has worked hard for Pickleball and I hope he enjoys it. Congratulations Tom. This proves one man can make a difference. A truly top guy. Belated Happy Birthday Tom.